The emerging field of spintronics leverages electron spin and magnetization. This could enhance the storage capacity of computer hard drives and potentially play an important role in quantum computing's future. Superconductor-ferromagnet (SF) structures are widely regarded as the building blocks of this superconducting spintronic technology. More conventional spintronic devices typically require large currents, so researchers are investigating the viability of low-resistance superconductors. Their new results could answer longstanding questions about how SF structures interact. An international team of researchers recently revealed a general mechanism of the long-range electromagnetic proximity effect in SF structures in Applied Physics Letters. They explain that SF interactions led to a strong spread of stray magnetic field to the superconductor from the ferromagnet. The group's findings could help determine why ferromagnetic films transferred magnetic fields to their corresponding superconductors at distances longer than theoretically predicted. Scientists previously thought that the interplay between the system's superconducting and ferromagnetic components occurred solely from superconducting Cooper pairs penetrating into the adjacent ferromagnet. Buzdin explained how in the case of normal, nonsuperconducting metal, for example, the spread of the magnetic field in the opposite direction from the ferromagnet into the metal layers is possible only at the atomic length scale. "For a superconducting material, it was believed that the scale of this spread [small] is of the order of the size of the Cooper pair, about 10 nanometers," said Buzdin. 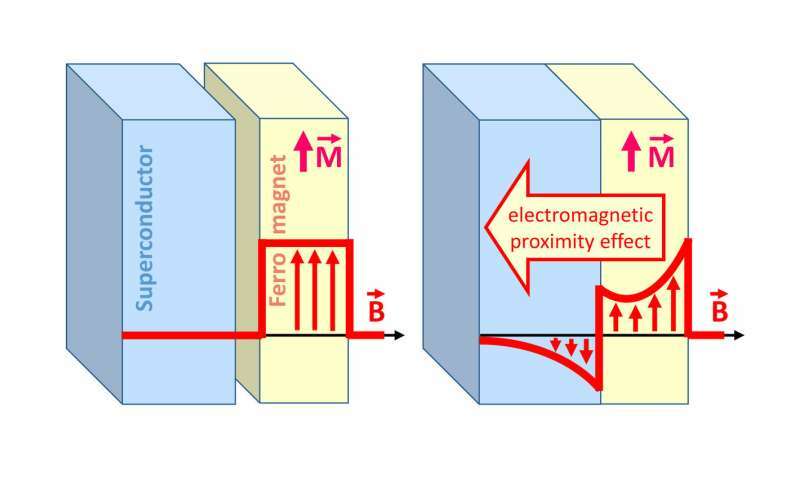 Themagnetic vector potential, which is commonly used to describe the local magnetic field, was the only non-zero electromagnetic characteristic in the region of the stray fields in the superconductor. The vector potential is generally not observable in a normal metal in these conditions. This led Buzdin and his colleagues to conclude that the penetration of Cooper pairs into the ferromagnet through the direct proximity effect is responsible for supercurrent flow inside the ferromagnet and the resulting appearance of the compensating supercurrents that generate magnetic fields inside the superconducting component.